Meliá Hotels International has announced the signing of Meliá Pekanbaru, marking the entry of the Spanish hotel group to the Indonesian island of Sumatra. The new agreement underscores Meliá’s rapid growth and momentum in Indonesia, where the group now has 16 hotels in operation and in the pipeline. 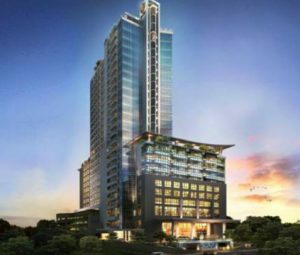 The hotel will form part of The Peak Pekanbaru Hotel & Apartment developed by PT Asialand Construction, and is expected to be completed by March 2017. The company is part of Citi Global Group, a sustainability-focused business group in Riau Province operating in diversified sectors such as property development, plywood, coal mining and others. Reinforcing Meliá’s position as a pioneer in urban leisure tourism, the new 160-room hotel will contain 5-star facilities such as a fitness centre and spa, swimming pool, several F&B outlets, sky garden, rooftop wedding chapel, extensive meeting rooms and a 700 square metre ballroom. Meliá Pekanbaru will rise 29 storeys above the city of Pekanbaru and is housed in the tallest tower in Sumatra Island overlooking the Siak River. Strategically located in the city connected to several international oil companies, the city is a major gateway and stopover for travellers going farther inland to other regions, such as Padang and Jambi. After over 30 years in the region and with extensive hotel management expertise, Meliá is now one of the one of the best-positioned hotel operators to help lead the growth of Indonesia as a major power in world tourism. In 2016 Meliá Hotels International celebrates its 60th Anniversary and maintains its robust momentum in Asia, aiming to double its portfolio in the region with the addition of 30 hotels in the next three years. The leading Spanish hotel has 33 hotels in the region, with six of them due to open this year.